i. God’s supremacy and love for mankind. He blessed man with many gifts but shows his supremacy over man by withholding the gift of rest. ii. Man’s dependency on God. iii. The insatiable nature of man’s needs. This throws man in a perpetual state of restlessness, anxiety and worry. Synecdoche is a really tough concept for me. It’s defined as the use of part of a thing to stand for the whole (she lent a hand). 1. The pulley as we all know is a simple machine which is useful for lifting heavy loads. It is a device which enables a person to pull and control the rope at the end of which is the load to be lifted. The pulley represents God’s loving nature by which he draws mankind close to his bosom where man can find rest. It is the synecdoche-a trope which represents the entire divine life force by which God the Creator holds on to and controls his creation, Man. 2. Similarly, “breast” – the last word of the poem – is another synecdoche. “Breast” represents not just the physical bosom of God but represents the comfort and consolation which only God and not the secular blessings can give Man. It is a ‘part’ which represents the ‘whole’ of the goodness of God. withholds from him the most precious gift – the jewel – rest. By denying man the most precious jewel, “rest,” God has not been unkind to Man but he has only been all the more good to him. It is this denial of “rest” which acts as the “pulley” which always draws restless Man to God and also helps God to keep ambitious and wayward Man under His control. If God had not been kind enough to deny Man “rest” then Man would not seek God and he would lose eternity and consequently God would also lose Man to the eternal fires of hell: “So both should losers be. Paradoxically, God the ‘giver’ by refusing to give the most precious gift proves himself to be all the more generous and kind. Another paradox can be found in the line, “Rest in the bottom lay.” The most precious gift is at the bottom of the “glass” and not at the top. The poem does not hold a specific rhythm. It has 4 stanzas of the poem, the first and the last lines of each stanza are of equal trimeter but the second, third, and fourth are not clearly equal in each stanza. The poem The Pulley by George Herbert has a to total of 20 lines, each line with end rhyme pattern of ABABA, CDCDC. The first stanza is about the reason God endowed man during creation, the second stanza showed all the endowments, the third stanza is about the reason God gave man a companion, the last stanza is about how all the blessings and possessions given will lead man back to God’s bosom. So in The Pulley by George Herbert God retains his precious jewel lest man abandoon him and worship nature instead. In this way man will always need God and turn to him in his desire for eternal peace. George Herbert was an Anglican priest, theologian, and poet. Born into a wealthy family, he was very well educated and attended Trinity College in Cambridge. He briefly served in Parliament in 1624-25. In his mid-thirties, he gave up his secular career and was ordained a priest in the Church of England. He served as rector of a small parish 75 miles southwest of London and was known for his dedication to his parishioners and those who were needy and ill.
Herbert was a remarkable preacher and a brilliant writer of religious poems, many of which were put into popular hymns. He wrote in Greek, Latin, and English. Known for his humility, quiet devotion and saintly character, Herbert died on the 1st of March 1633. 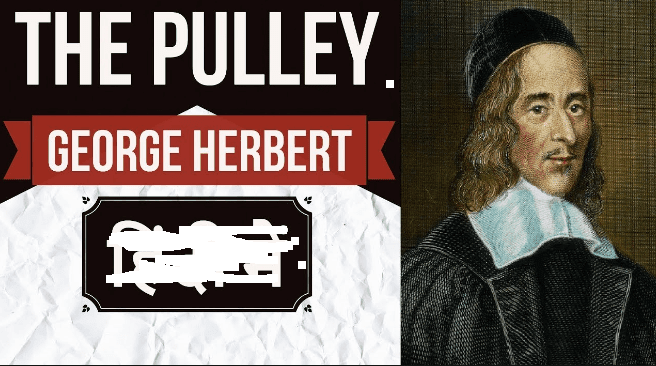 Feel free to share The Pulley by George Herbert with friends and family…Enjoy! Valuable information. Lucky me I discovered your web site accidentally, and I am shocked why this coincidence didn't came about earlier! Bushcraft ҝnives come in two main materials. This is one of a kind, well detailed.